Fear of a Nigerian attack on the Gambia is growing as the deadline for Jammeh to leave power nears. Report out of Gambia is that the Nigerian Army has raised a battalion whose task is to forcefully remove President Yahya Jammeh from power if he fails to step down as his term comes to an end January 19. After losing the December 1, 2016 general election to his rival Adama Barrow and then conceding defeat, Jammeh had days later, changed his mind, causing the Commission President of ECOWAS, Marcel de Souza, to indicate that the body had put standby forces on alert to oust him. 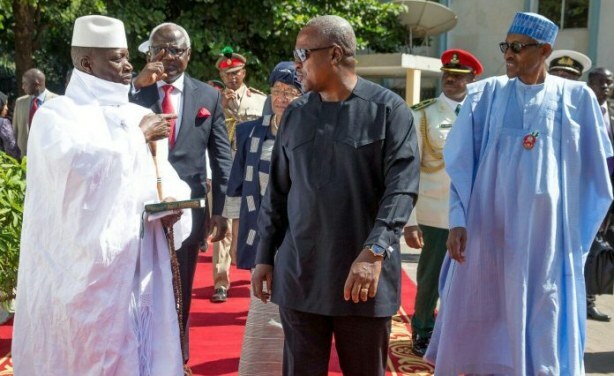 Jammeh had remained defiant, using his New Year Day’s speech to castigate the resolution of ECOWAS that calls on the implementation of the results of the Dec. 1, 2016 presidential election by whatever means possible. Earlier, Nigeria’s Foreign Affairs Minister, Geoffrey Onyeama had indicated that Nigeria will do everything possible to help the Gambia have a peaceful resolution to its political crisis, expressing optimism that Jammeh will hear the voices of his people. Onyeama further expressed belief that Jammeh would honor the call of the ECOWAS leaders to bow out of office at the end of his mandate on Jan. 19. “We will like to believe that he will listen to the voice of his peers in the sub region ECOWAS. “And that he will also listen to the voice of his people but above all he will follow the democratic path. So, we will do everything possible to bring that about. “Essentially, we want a peaceful resolution to the issue, you know we have experienced conflict in our country and we know how far back in development conflict can take a country to. “So we will do everything possible to help Gambia have a peaceful resolution to this political crisis,” he said. But with the January 19th date fast approaching and no signs that Jammeh is willing to accept his fate, reports are now surfacing of Nigeria planning to take him out. Leaders of ECOWAS are appealing to him to leave office and are reportedly seeking an ‘honorable exit’ for him. In that light, Nigerian law makers are lobbying for Nigeria to grant him asylum, ensuring that his exit would not lead to him being tried for various human rights crimes he is alleged to have committed while in office.